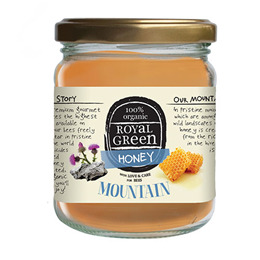 Our organic honey is not blended with cheap (blend)honey and is 100% pure, certified organic and from countries like Cuba, Mexico, Hungary, Germany and Portugal. We do not use pesticides and our bees feed off their own honey. It is cold-extracted, not filtered and you may taste the difference. Honey is not recommended for children less than one year old. Below are reviews of Royal Green Organic Mountain Honey - 250g by bodykind customers. If you have tried this product we'd love to hear what you think so please leave a review.